It’s a simple ‘ding ding’, but when there are more than 160 of them it adds to the cacophony of noise along the tramways of Hong Kong Island. But one old double-deck tram in particular stands out from the rest. 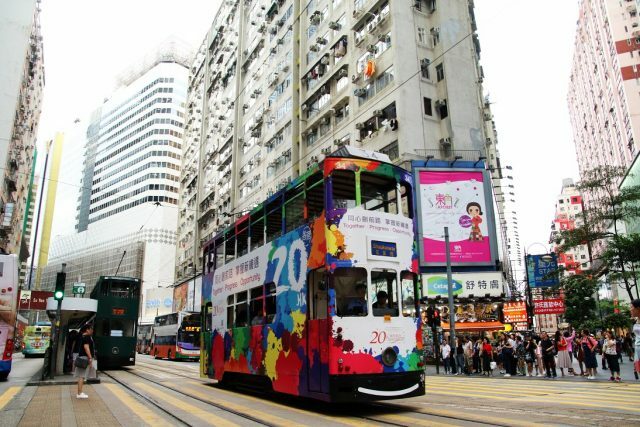 It’s the one that runs on the ‘Tramoramic’ tour between Causeway Bay and Sheung Wan’s Western Market – or vice versa. As part of a three-pronged attack on completing three value-for-money attractions in a day – morning, afternoon and evening – I jumped aboard the 1920s-style open top tram for an ear-piercing slow (very) journey from the Causeway Bay Terminus to the Western Market Terminus via a branch circulating Happy Valley racecourse and through bustling streets filled with ultra-modern cityscapes, as well as colourful history and modern culture. The one-hour tour, with free WiFi and recorded commentary with authentic tales of local life and tram history in eight languages, costs HKD$95 adults and HKD$65 children. And to make it even more worthwhile, you get a two-day ticket for unlimited access on Hong Kong Tramways network. It was time to move on to transport that runs faster (not by much in Hong Kong’s traffic jams), so I headed for the hop on/ hop off Big Bus, which operates daily on three routes (red, blue and green). I opted for the green route from the Central Ferry Pier 7 – mainly because the price included a trip on the 130-year-old iconic Peak Tram without having to queue. And the wait at times can be long. Very long. Back downtown from the heady heights of the Peak, the Big Bus joins the heavy traffic to Ocean Park, then along a winding coastal road to upmarket Repulse Bay, where there are opulent homes overlooking the sea – and even a Ferrari dealership on the waterfront. Next stop is Stanley, where I hopped off to grab a bargain or two at the renowned market by the South China Sea. Stanley has changed dramatically over the past decade with the market losing many of its bargain clothing stalls and the place looking somewhat tacky. But the choice of al fresco dining options along the main street on the promenade more than made up for the disappointing market. Big Bus ticket costs range from HKD$480 for a one-day ticket that also includes a trip on the Star Ferry. A two-day de-luxe ticket – costing HKD650 – also includes a one-hour tour on Victoria Harbour and Kowloon nightlife tour. No first-time visit to Hong Kong is complete without a signature seafood feast at the giant Jumbo Kingdom floating restaurant in Aberdeen, the last stop of the Big Bus green route. Located at the Aberdeen Typhoon Shelter, there’s a free shuttle ferry to Jumbo Kingdom from Aberdeen Promenade Pier and Wong Chuk Hang Shum Wan Pier. Now in its 42nd year, Jumbo Kingdom is best known for its fresh seafood (customers can select what they want from a huge fish tank), traditional Cantonese cuisine and dim sum. The restaurant’s interior and exterior were built following the design of the royal court of Ming Dynasty. It took four years to complete at a cost of HKD$30 million. Over the years, Jumbo Kingdom has been the film set for many movie blockbusters. Whether you’re just passing through or it’s your main holiday destination, there is plenty to see and do in Hong Kong. But you certainly have to plan, and be patient, as it is certainly bustling; busy is an understatement!